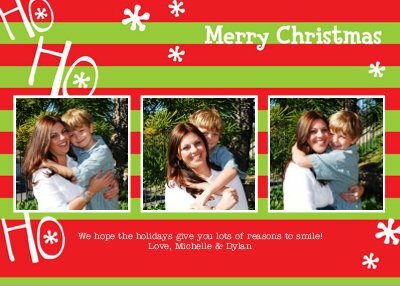 This year we decided to go with a photo card and who better to take the pictures than our favorite Aunt Stephanie. Forget the perfectly posed portrait, we like candid, laughing, this is who we are pictures! No Dylan, don't smile, don't do funny faces, don't make bunny ears behind Mommy's head ... yep, threw those rules out the window and had a blast just being us! For some reason, I adore this picture. Maybe because the expression on his face that I love so much was finally captured on film. He may be 60+ pounds, but he will always be my baby!